Tibetan spiritual leader the Dalai Lama teaches the Buddhist faithful near Leh, India, on his 79th birthday. Speaking before tens of thousands of Buddhists, including Hollywood actor Richard Gere, the exiled Buddhist leader implored the faithful in the majority-Buddhist countries to refrain from such attacks. “I urge the Buddhists in these countries to imagine an image of Buddha before they commit such a crime,” he said in the Indian town of Leh. Rising Buddhist nationalism in both countries, spearheaded by movements led by extremist monks, has led to communal violence targeting Muslims in recent years. In Myanmar, religious violence has left more than 200 dead and close to 150,000 homeless — predominantly members of the Rohingya Muslim minority, since unrest broke out in in the western state of Rakhine in June 2012. Outbreaks of anti-Muslim violence have also occurred elsewhere in the country. Curfews were introduced in the second-largest city, Mandalay, last week after rioting left two dead and 14 injured. Human rights groups said that extremist monks helped incite last week’s violence, and were present in the rioting mobs. In Sri Lanka last month, four people were killed in nights of religious violence in which Buddhist mobs attacked Muslim neighborhoods around the southwest town of Aluthgama. Witnesses told CNN the rioting began after a rally organized by the far-right Bodu Bala Sena (Buddhist Power Force) group, at which the group’s leader, a monk, gave an inflammatory speech against Muslims. The Dalai Lama, who has lived in exile since 1959, has previously spoken out about the violence perpetrated by Buddhist nationalists. In May last year, he made comments at a U.S. university decrying the violence in Myanmar, and he has written to Aung San Suu Kyi, a renowned Burmese pro-democracy campaigner and fellow Nobel Peace Prize winner, calling for a halt to the violence, his staff said. 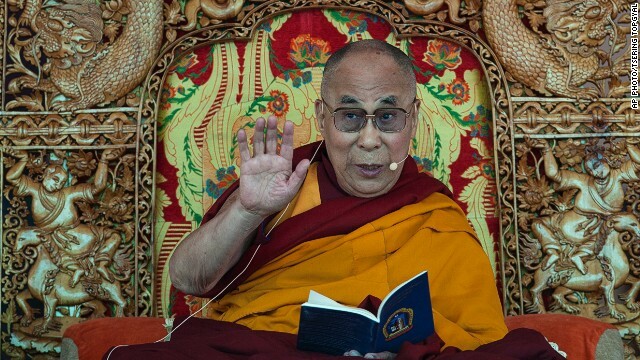 The Dalai Lama was speaking before the audience in Leh to confer Kalachakra, a process intended to empower tens of thousands of his Buddhist followers to reach enlightenment, his office said.